This new video features Khitam Sa’afin of the Union of Palestinian Women’s Committees; Abla Sa’adat, activist and the wife of imprisoned Palestinian leader and PFLP General Secretary Ahmad Sa’adat; and Qadri Abu Wasel of Abnaa el-Balad, speaking in El-Bireh on 20 July 2016 in solidarity with Palestinian prisoner Bilal Kayed. Kayed has been on hunger strike since 15 June 2016 in protest of his administrative detention without charge or trial, imposed upon him after the completion of his 14.5 year sentence in Israeli prisons. Kayed is currently held in Barzilai hospital, shackled hand and foot to his hospital bed. He consumes only water and refuses salt supplements, vitamins, and medical examinations. 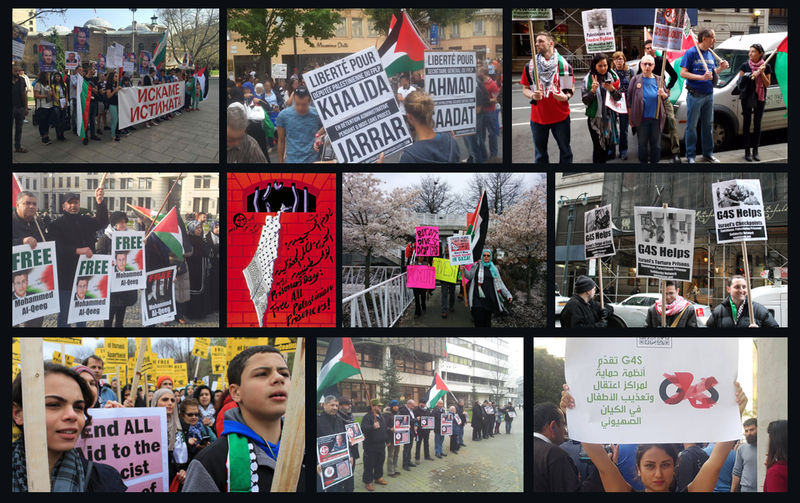 Over 150 Palestinian and international organizations have joined the call for freedom for Bilal Kayed, with events and protests demanding Kayed’s freedom taking place in cities throughout Palestine and around the world. Protests for the freedom of Bilal Kayed are scheduled to take place today in Ramallah, Bethlehem and Gaza. Other demonstrations will take place on Wednesday in Nazareth and Umm al-Fahm, with further events in New York City and Brussels on 21 and 22 July. 20-30 July will be ten days of international action for Kayed’s release and in support of the growing collective hunger strike and prisoners’ movement protest.